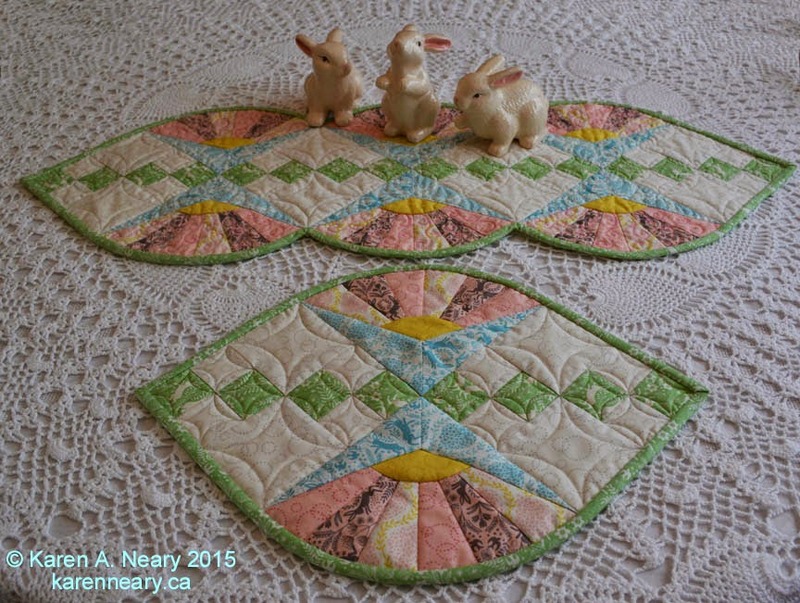 This gorgeous version of Rhythmic was made by Roxanne Miner of Alberta. 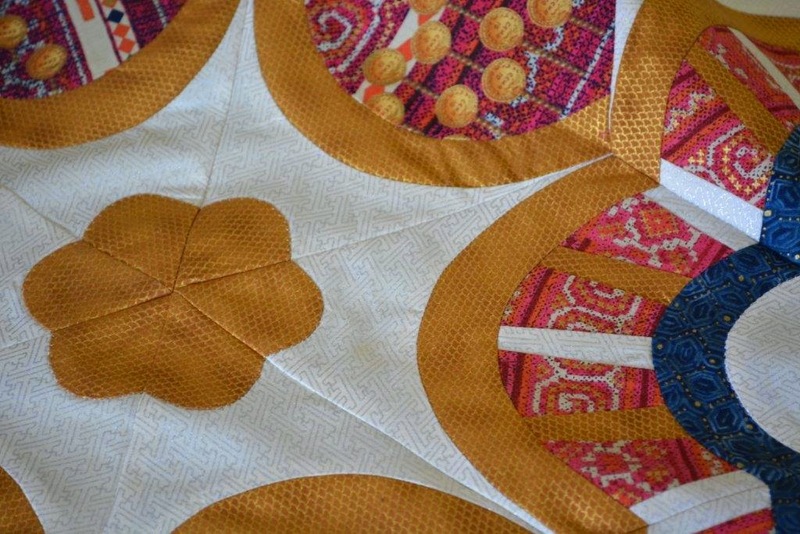 It is exciting to see her linear quilting, as it complements the modern look of her quilt so very well. It's perfect! Looks like she has used the edge of her walking foot to space her lines, thus eliminating the need for marking. 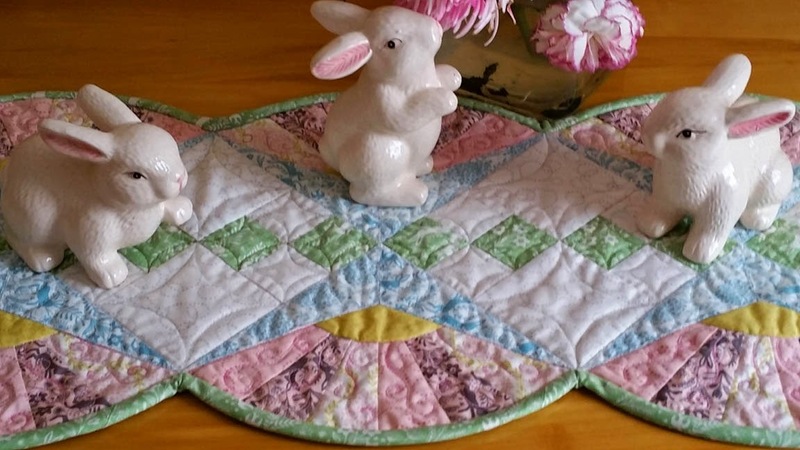 Roxanne downloaded her pattern through Craftsy and posted the finished picture of her quilt in the Community section of that site, where members share photos. 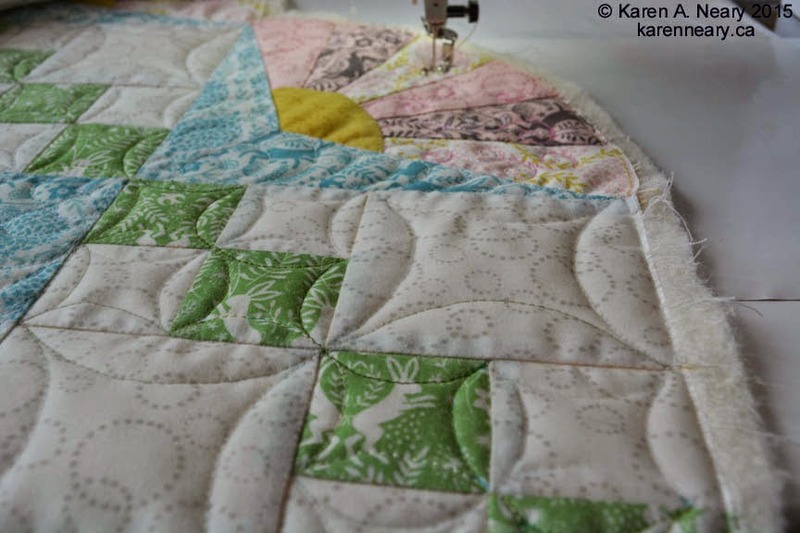 You can see more of Roxanne's lovely work on her blog. Thanks so much, Roxanne, for the inspiration! 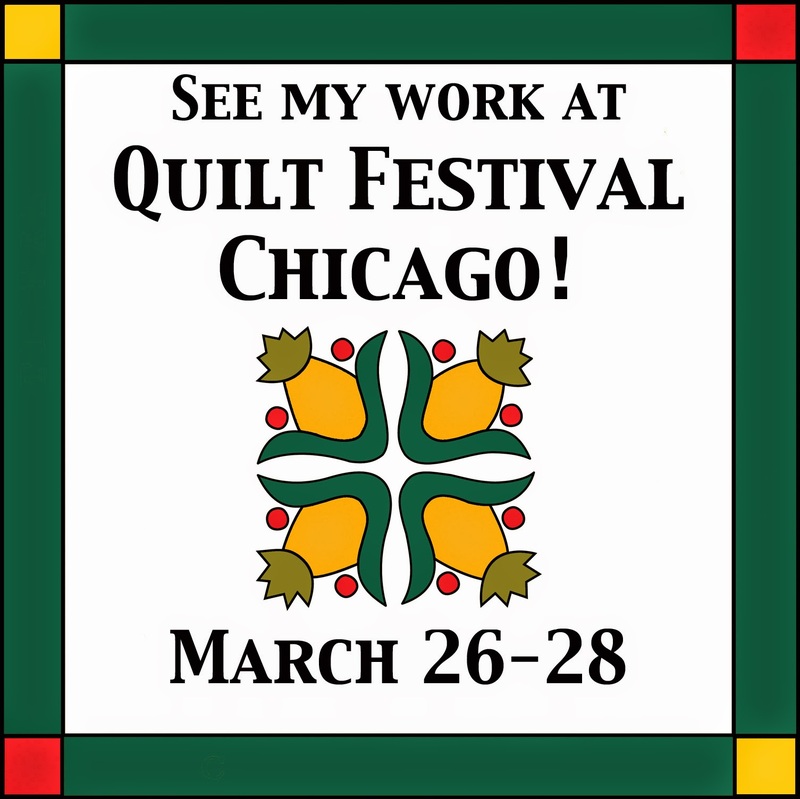 The Red & White exhibit of quilts for the Jubilee Celebration of IQF will be shown in Chicago (Rosemont) March 26-28 at the Donald E. Stephens Convention Centre. My Log Canada is part of this travelling show, and if you are headed there, I hope you will share some pictures. This is actually the second time that Log Canada has appeared at this show. It was part of the original "O Canada" exhibit which toured the U.S. in 2009. Here's a link to a post from back then. Hmmm...wonder if Regina is planning to attend again? 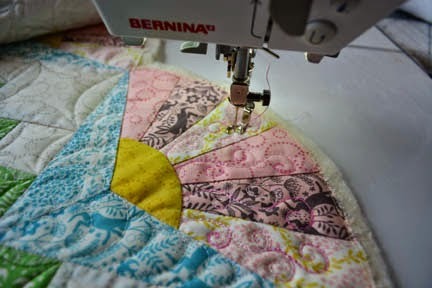 I had a lovely surprise email from someone I hadn't seem in ages, made even more special by the fact it contained a picture of a quilt. Dorothy Travis was one of the first people we met when we moved to Amherst 20+ years ago. I showed up at Trinity United one hot summer day to register a very excited almost-four year old for vacation Bible school, and Dorothy welcomed him in. Dorothy has been busy making quilts for her grandsons as graduation presents, and this one shown above is for Blake who requested one with lots of colour. Dorothy writes that she spotted this pattern at Dayle's during last year's Fibre Arts Festival and knew it was perfect for him, as her colour-loving grandson had often read scripture at church and knew the story behind the coat. She used materials that her daughter brought back from one of her trips to Australia, making the gift even more special. 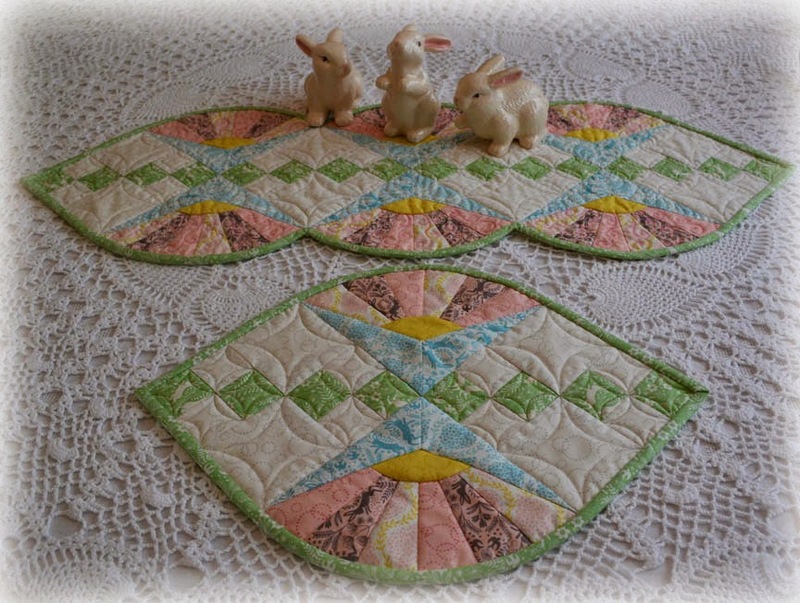 My original Coat of Many Colours is below, and you can see that Dorothy improved upon it with the addition of a bright print border - much jazzier than my plain one! It also brought the quilt out to a good size for the bed. 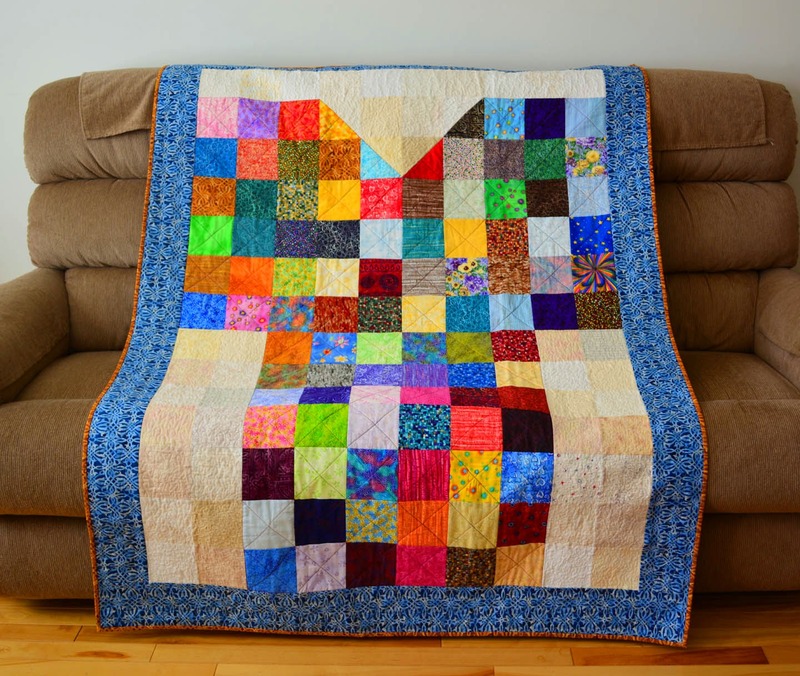 Joseph's Coat of Many Colours is a very simple patchwork pattern, perfect for beginners and for using up lots of scraps. If you'd like to try your hand at a Coat of Many Colours, the pattern is available from my website, or as an instant download from Craftsy. 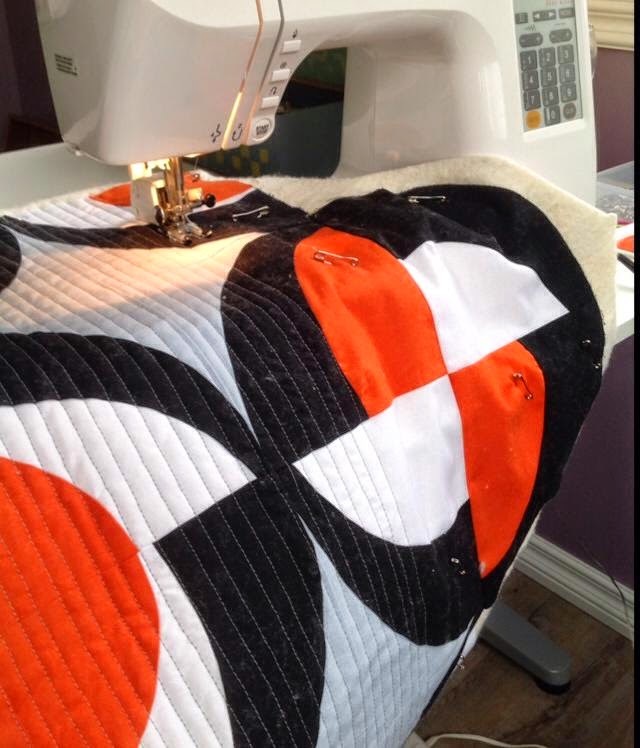 Thanks for sharing this, Dorothy - I know Blake will love his quilt! That's every day in my world! Wishing all a creative, fun, and relaxing day. Just in time for the first day of spring, Mrs. Pugsley's Emporium has kits available for the Felicity Table Runner - a world exclusive! 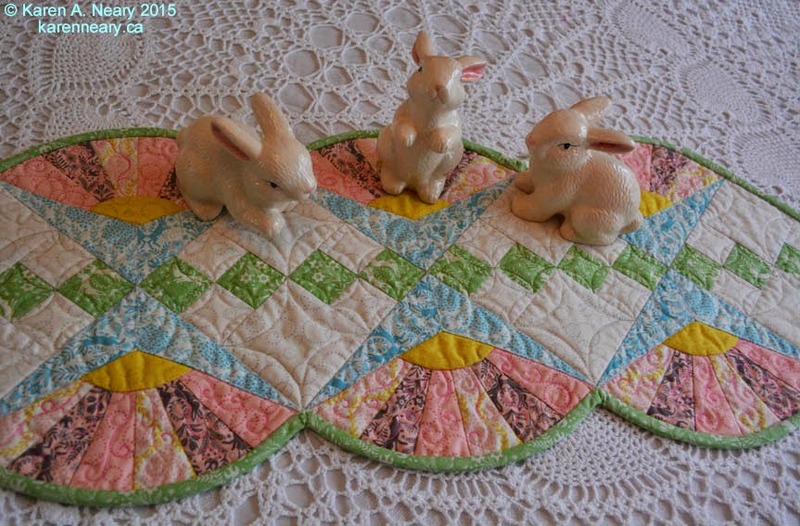 Kits are $42.95 and include pattern and fabric enough for a runner and two placemats. These are available via mail-order, just email Mrs. P.
I went to Mrs. Pugsley's Emporium on Friday to get some black fabric to make a backing and hanging sleeve for Rhythmic. 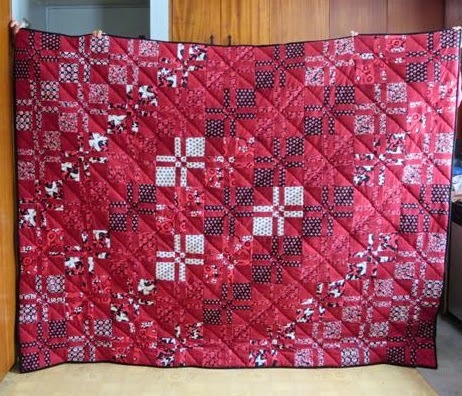 One of the requirements of the Paducah show is that odd-shaped quilts be mounted on a plain black backing to make it easier for the organizers to hang the quilts. 1.5 m of solid black isn't a very interesting purchase, so I looked around to see what was new in the shop. 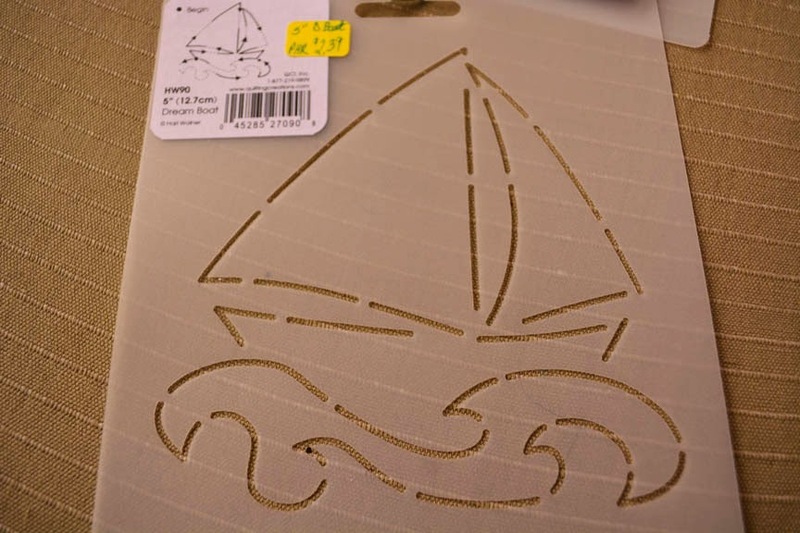 There were a lot of new notions in, and a pile of stencils caught my eye. Isn't this sailboat sweet? 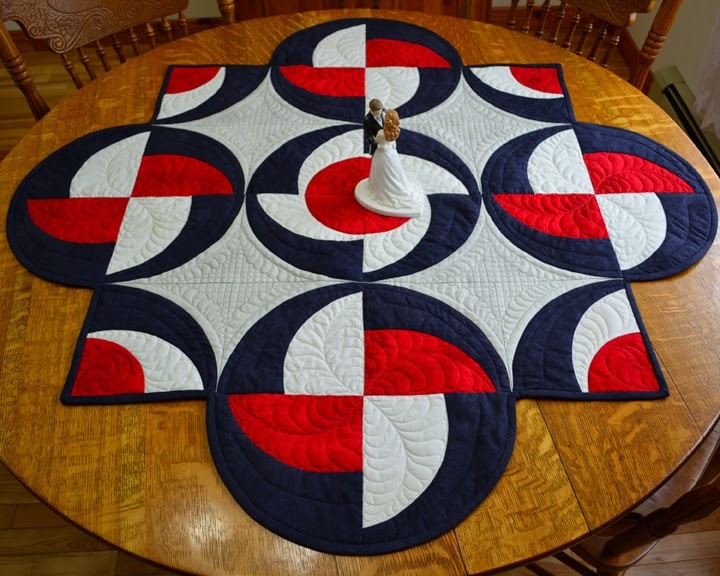 It's designed by Hari Walner, a woman whose books were a great help years back in my machine quilting. I decided it needed to come home with me...because you never know when you might need a sweet little design like this. 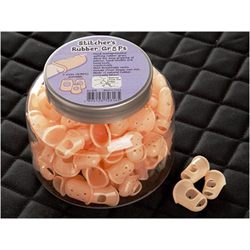 At the counter, I caught sight of a jar of what looked like dismembered digits...but upon closer inspection turned out to be rubber finger cots for use in machine quilting. Ooowww, I'd better have some of those. These odd do-hickeys come in three sizes, small to large, so I chose 2 of each size. While the blizzard raged outside, I decided to try out both the stencil and the finger cots. I cut out a simple bib shape and layered it right sides together with backing and batting. It will close with a piece of Velcro instead of ties, so I left the bottom open for turning. Notice how when I start and stop sewing, I turn my work to run the stitching right off the edge. Doing it this way makes the edges turn in much easier. All the curved edges were clipped before turning. Then the fun part. I centred the stencil on the bib, and traced through the openings with a Frixxion marker. Wearing those sticky finger cots, I followed the lines with free motion stitching using a YLI variegated blue thread. The rubber fingers gripped the fabric well and were not as cumbersome as gloves. 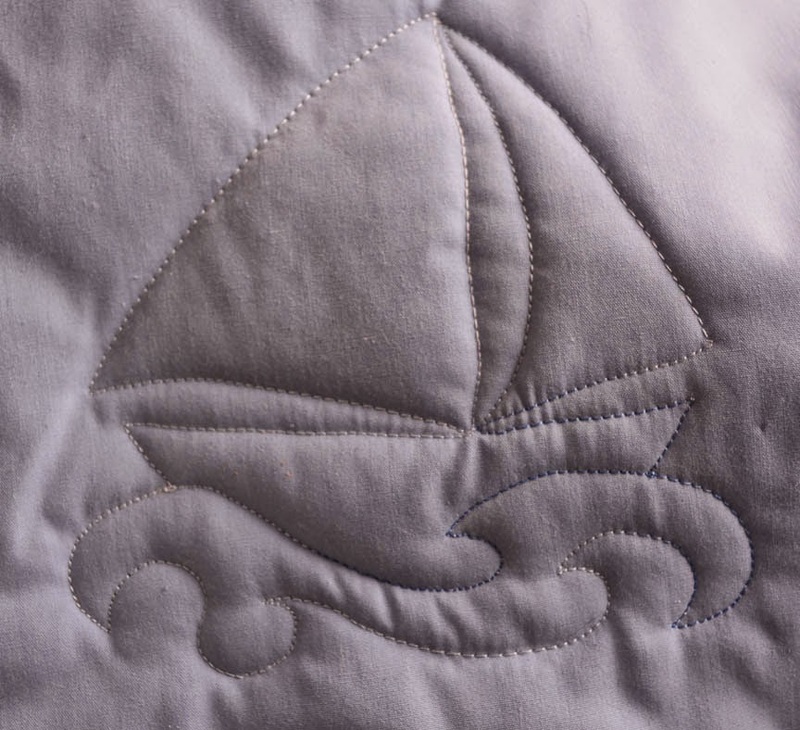 A breeze came up and knocked my stitching a little crooked on the sail (hey - I mentioned there was a blizzard outside, right?!) but it was a simple path to follow, and really cute. I can't wait to try this design out on a real quilt. I guess it's not like we weren't warned that the Ides of March could be a troublesome day. 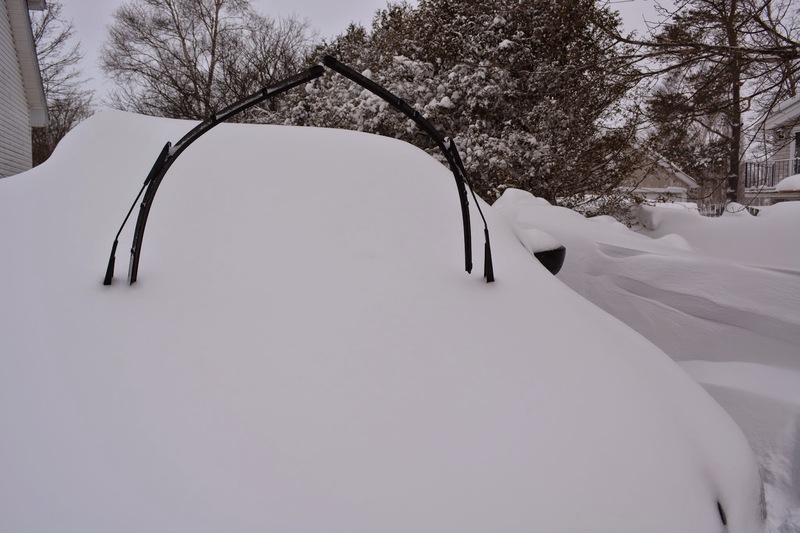 We had warning that a big snow was coming; up and down the street, windshield wipers were raised in anticipation. (that's so they don't freeze to the windshield, Jennifer, or get damaged under the weight of the snow). 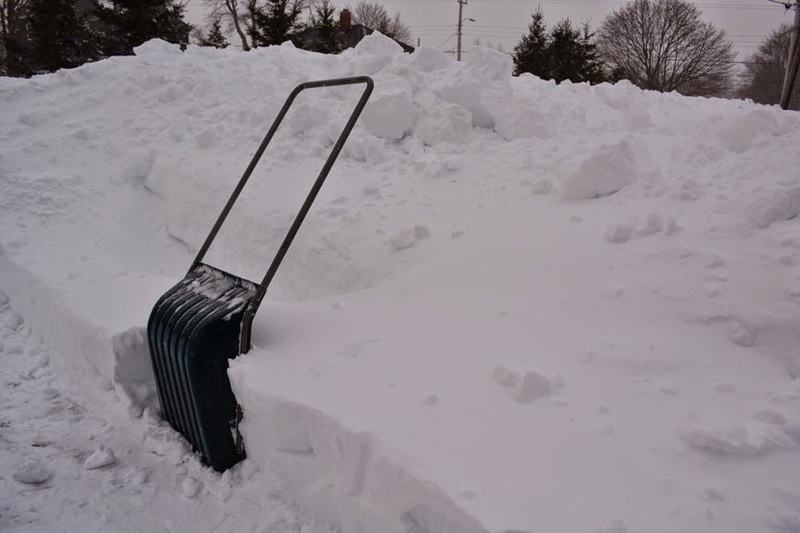 Reading online reports, it appears Amherst got around 40 cm in yesterday's blizzard. 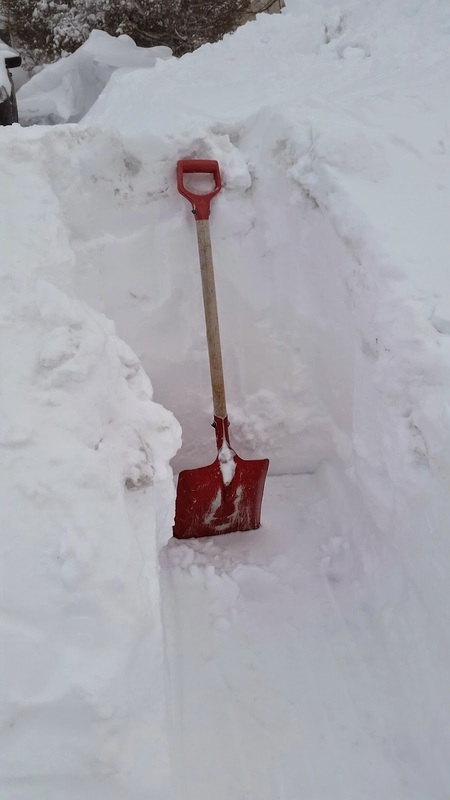 Here's what we shovelled through at the end of the driveway. The driveway is a work in progress, exactly one car-width at present and not a flake more. Here's the view of our house from the street. 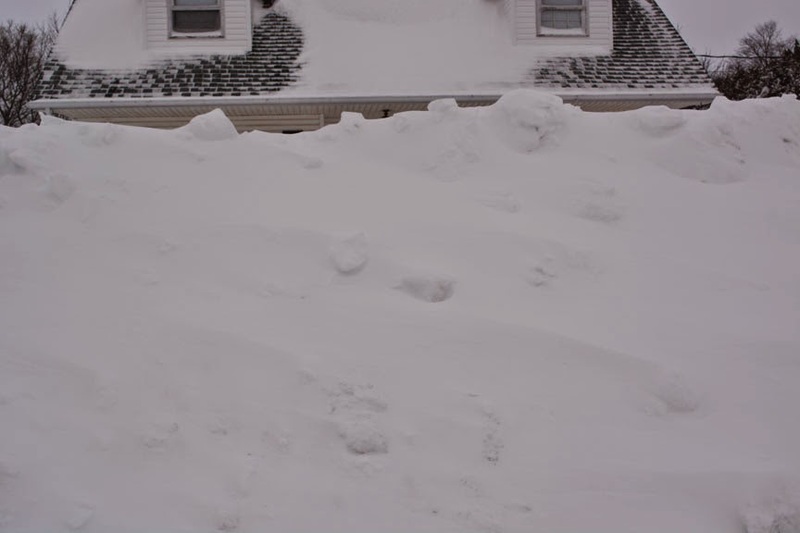 From inside we can't see over the snowbanks...nor could Polly see us out the front window. She had to come out for a minute to check on us. 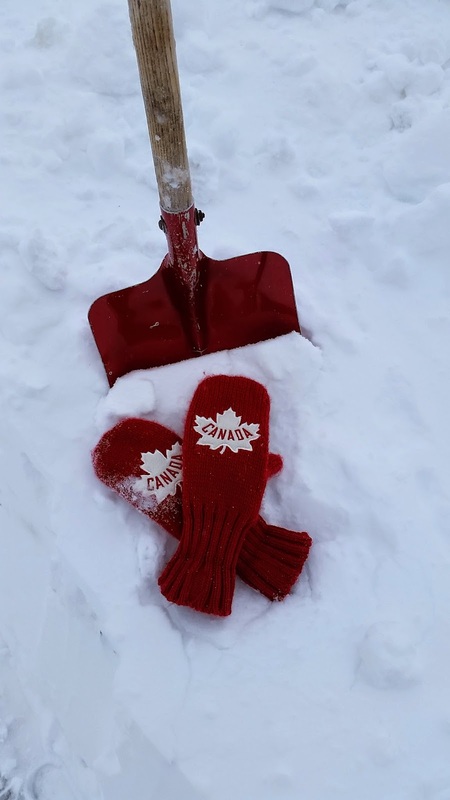 Spring is how many days away...?? 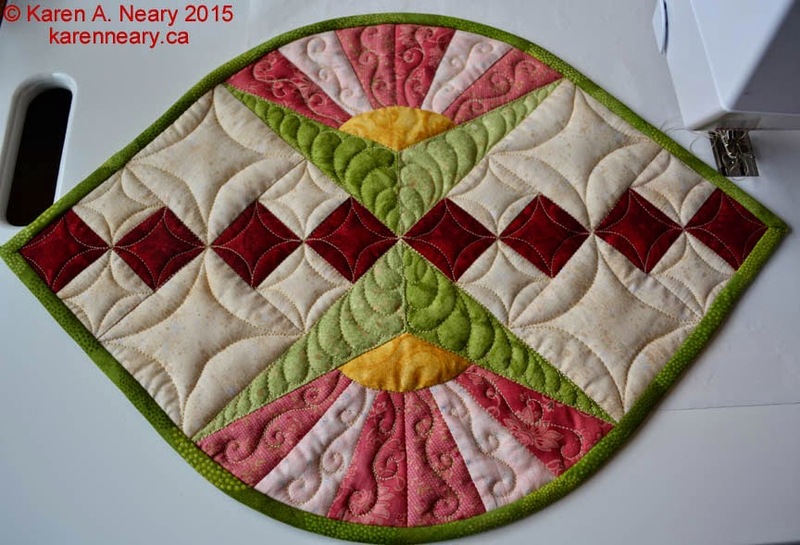 If I have the story correct, the fabric for Karen's quilt was won by Shari in a big basket of goodies donated by Dayle's one year for the block contest they sponsor for Fibre Arts Festival. Since I seldom ever delete anything (! 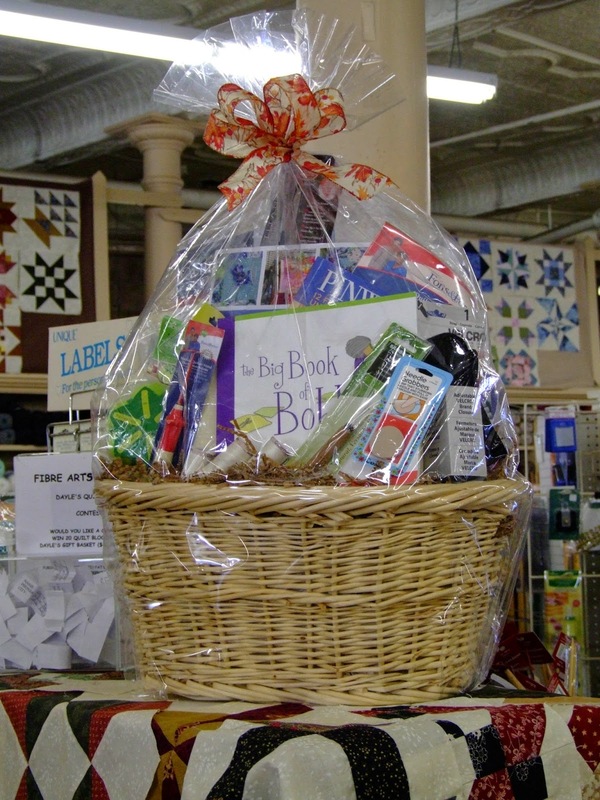 ), I went back through my files to see what I could find, and sure enough - I think the fabric is in this basket, from 2010. Look at all the goodies in there! 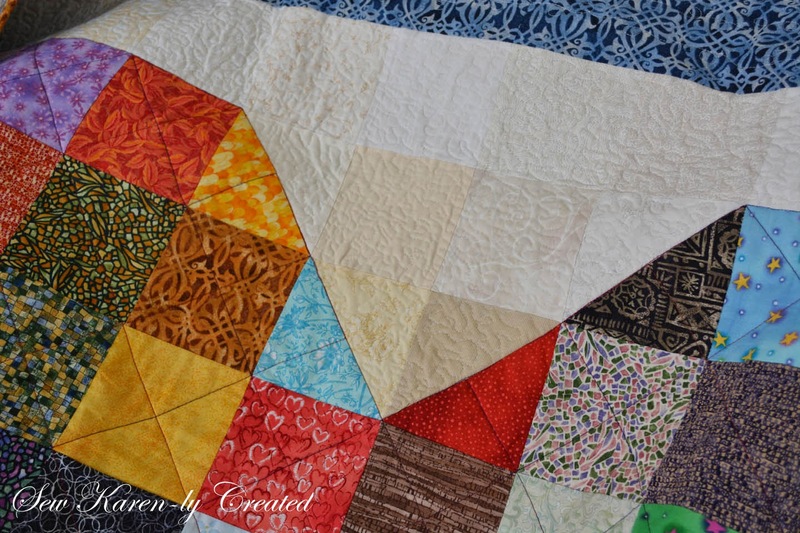 Shari shared her bounty with Karen and writes that there is enough of the fabric left to be used in a second quilt, with the addition of a few other prints. 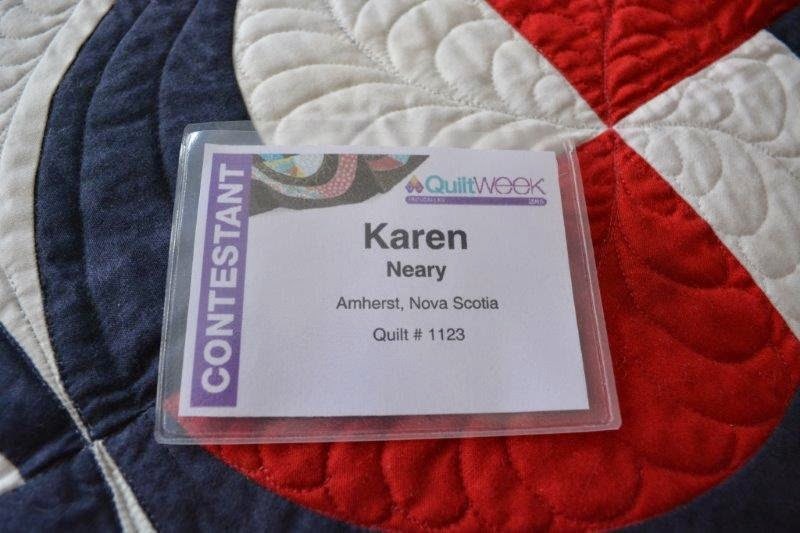 Thank you Shari and Karen for sending along the picture of the quilt. There's been an awful lot of "new" in my life lately- all of it wonderful- but change can be a painful process... For all of you whose address book contains my email, can you kindly delete all reference to sewkaren AT ns.sympatico.ca and replace it with: karen@karenneary.ca The new address is all set up and working great, the old one will expire soon. I am sure I will be months finding and updating email links; I have used the sympatico one for about 20 years now. Bear with me! 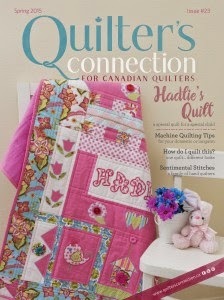 If you are looking for tips on how to make quilting on your home sewing machine a bit more doable, check out the spring issue of Quilter's Connection magazine. 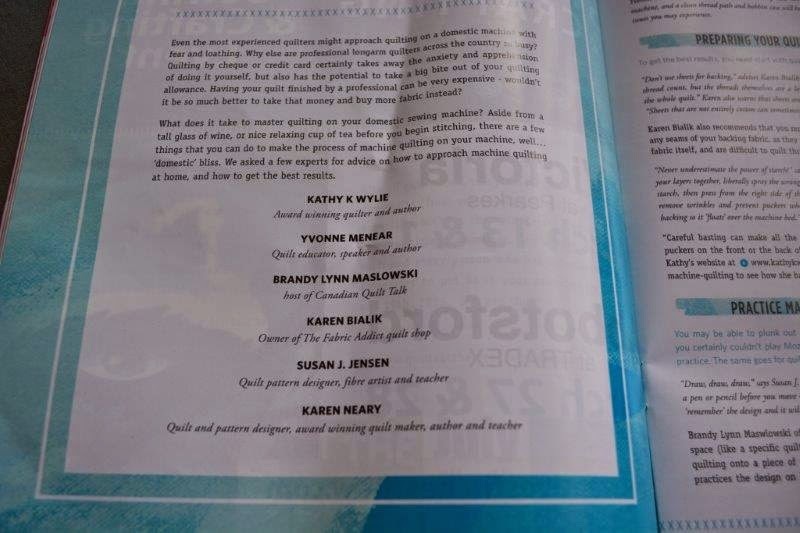 Inside are tips from several quilters, including yours truly! awarding first‐, second‐, and third‐place prizes in 16 categories, along with nine overall awards. Workmanship; and $5,000 for the Moda Best Wall Quilt. 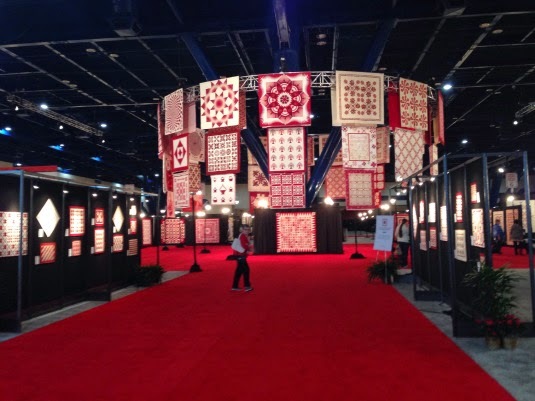 Regardless of how RHYTHMIC places in the final judging, all semi‐finalists’ quilts will be displayed at the show, which is expected to draw more than 30,000 people. Rhythmic has had a very good year, and the pattern has been extremely well received. I am thrilled to have this quilt as part of the AQS Paducah show. It's here! No not spring, but something to remind us it's coming! This is the new design I have been working on. It's called Felicity. The fabrics are a sweet new collection from Lewis & Irene - a British company - called Spring Hare. 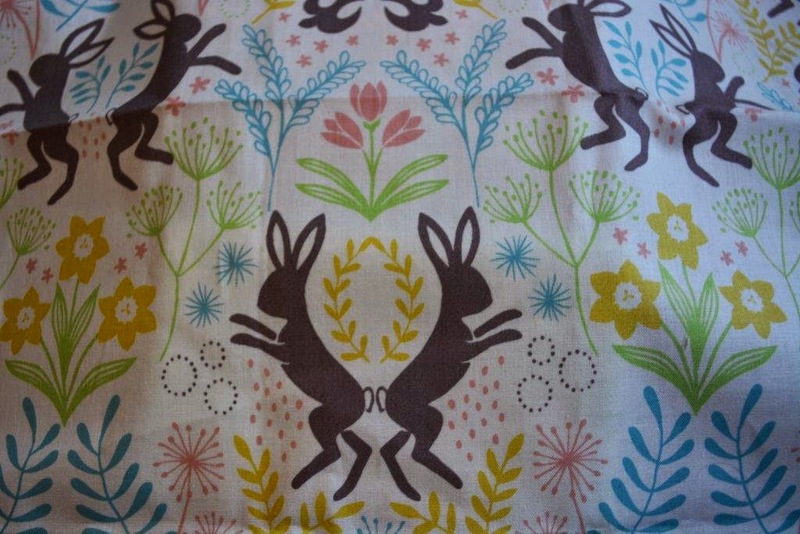 Though the prints do feature bunnies, the look really is more like 30's fabrics. Such a soft palette is not something I normally work with, but I have enjoyed these...and they go great with my china! The batting is Tuscany silk, which is perfect for a table set as it isn't thick or lumpy, yet it allows nice definition to the quilting and lets the stitching show. It's rather simply done, mostly continuous curves with a few feathers thrown in for good measure. 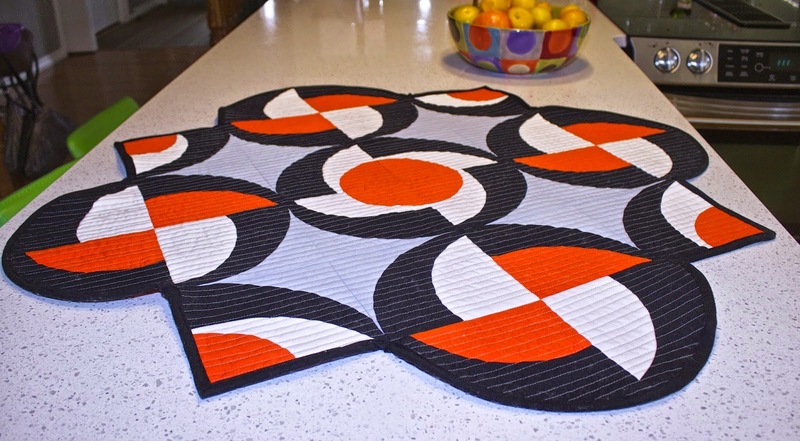 The runner measures 12-1/2" x 33-1/4", and the pattern includes instruction for matching placemats. That mischievous middle bunny kept sniffing the flowers. I had fun trying out different dishes for the photo shoot. 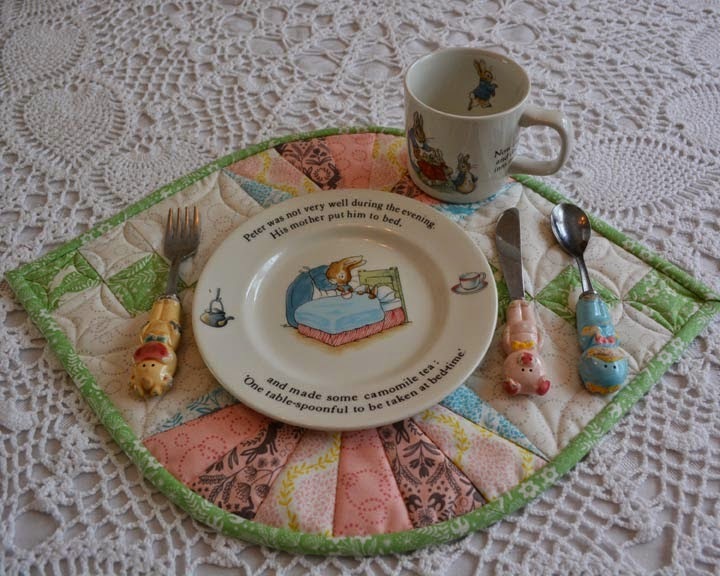 The Peter Rabbit ones were perfect, as is this well-worn cutlery set of a cow, pig and chicken. It looks equally inviting with my Tranquility china; all the colours are there. Would you like to come for tea? 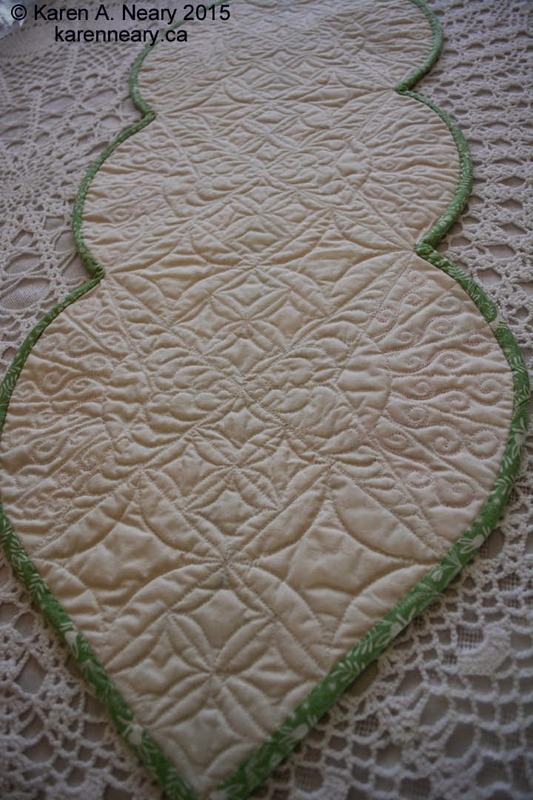 I stitched a sample placemat to try out the fit of the templates, as well as to audition the quilting stitches. This one uses a double layer of wool batting so you can really see the stitches pop. 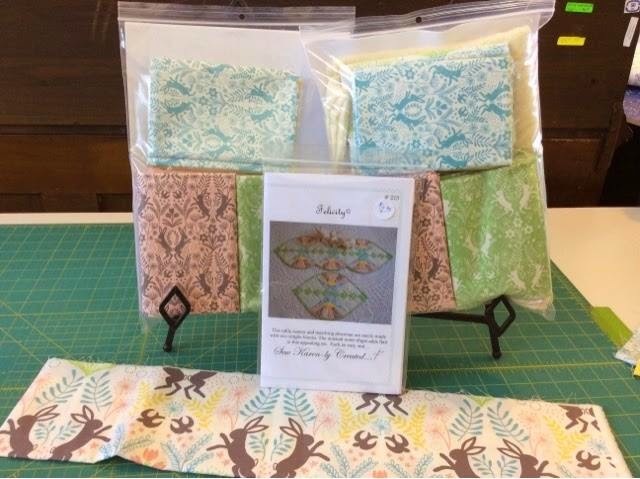 The exciting part is that Mrs. Pugsley's Emporium in Amherst, Nova Scotia carries the full line of Spring Hare fabrics in her shop, and a kit (including the pattern) to make this set is available exclusively from Mrs. Pugsley's! Details will be posted on her site soon. If you would just like the pattern by itself, it is available for purchase locally at Mrs. Pugsley's Emporium, through my website, or as an instant download here. We are hopping right along with the runner in the Spring Hare collection. The piecing is complete and I had fun choosing threads for the quilting. I am by no means a thread snob - I love it all, and have a huge variety of weights, colours and brands on hand. The bobbin thread is a 100 weight (i.e. very fine) Wonderfil Invisifil. 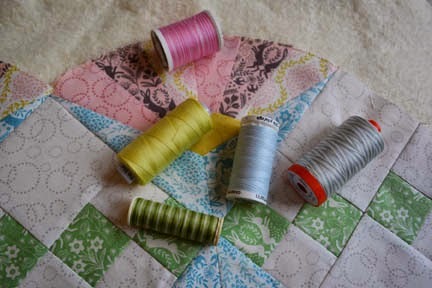 For the quilting, I chose 5 different colours: a pink/cream variegated by Sulky, a solid yellow Konfetti by Wonderfil, a pale blue cotton Gutermann, a silver/white Aurifil variegated, and a green variegated Gutermann which I've had since Moses was a baby. That Gutermann was the first time I had seen variegated sewing thread in a store, and in my excitement, I bought all of it, in all the colourways - the entire thread display! It was my first experience hoarding thread...(sadly not my last...:)) I have two spools of the green left, and one of a Christmas red/white/green. It was a well-loved investment! 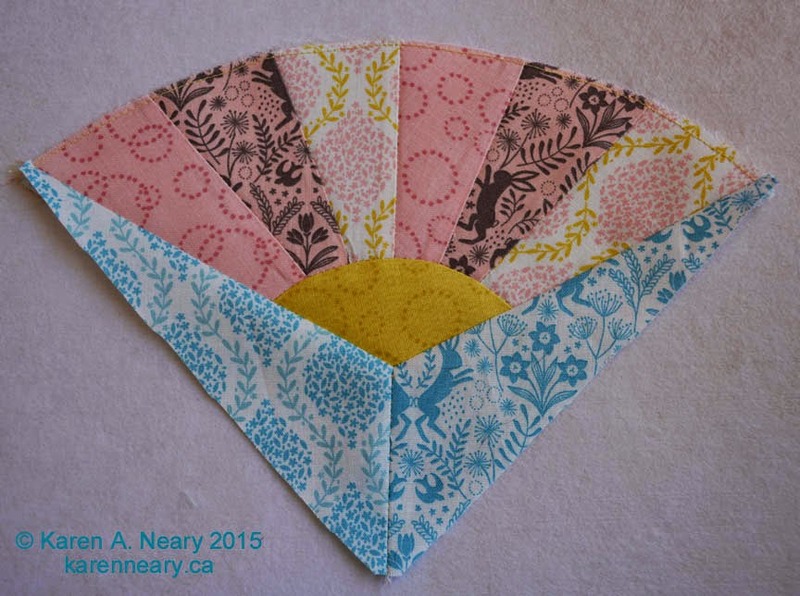 I picked up this pink Sulky at The Quilt Gallery in O'Leary last summer and have been itching to use it. 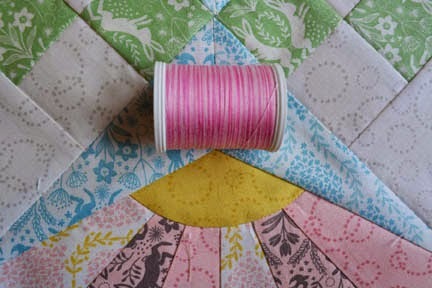 It has the perfect blend of shades from dark pink to cream to work with the blades in the fan blocks. It was a tad heavier than the rest - a 30 weight - but I liked the effect. It was like embroidering small scrolls. Because of all the variation in thread thickness between my top and bobbin threads, it was necessary to adjust the top tension with each thread so that my stitches were perfect. I am always amazed at how reluctant students are to do this! For the 30 weight pink thread, I had to call on the bobbin case's secret weapon - I call it a stitch finger, I have no clue what it's really named. Not all machines have one, but if they do, it's a wonderful help to proper tensioning. You can see I've simply run my bobbin thread through the tiny hole at the top of the finger before inserting the bobbin back in the case. It tightens up the bottom thread just a tiny bit - way easier than moving the screw. The quilting is almost finished up, so I will show you the rest soon. When the calendar says "March", we all automatically think "spring" (despite the fact that outside my window I can see it is snowing again!) 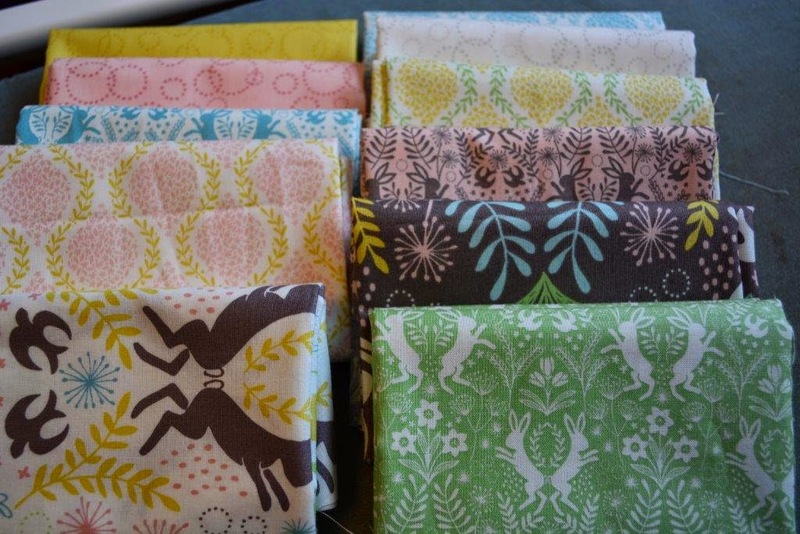 Last week, I picked up this new collection of fabrics by Lewis & Irene at Mrs. Pugsley's Emporium. It's called Spring Hare. 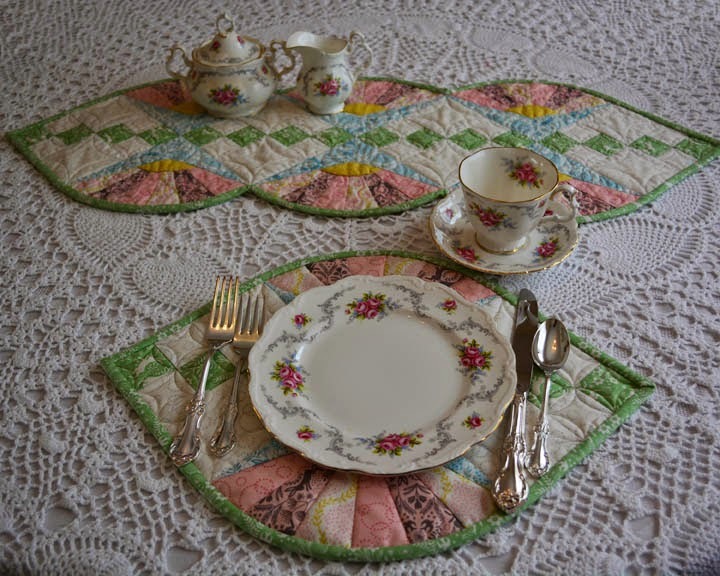 I've got a new design for a tablerunner and place mats which needed spring colours. I love the shade of blue - kind of like a robin's egg. It may be awhile before we see any robin eggs around here in real life though!